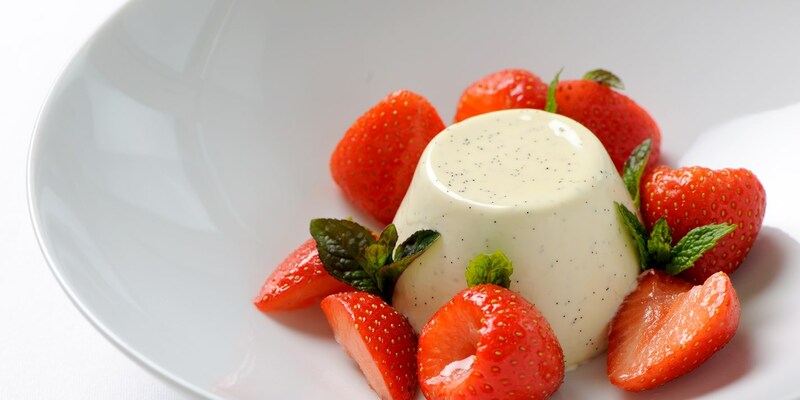 Panna cotta is a traditional Italian dessert which literally translates as 'cooked cream'. Hailing from the region of Piedmont in Italy, it is a simple mixture of sweetened cream and gelatine. A good panna cotta is one that is only just set but can still stand unsupported once out of the mould. Panna cotta is very easy to make and can be made the day before a dinner party to save time. Traditionally panna cotta was always made with just cream; however, as tastes change and people move away from heavy foods, chefs now tend to use a percentage of milk in their recipes to make panna cotta a lighter dessert which is also healthier. As it is such a simple creation, panna cotta benefits from the addition of flavourings. Alan Murchison flavours his panna cotta with white chocolate, Josh Eggleton uses caramel for a intense richness and Greg Malouf creates a floral panna cotta with the addition of rose and buttermilk. Most herbs and sweet spices work well; you could try mint, lavender, elderflower or even honey. Shaun Hill perfectly executes a Vanilla panna cotta and accompanies with fresh summer berries for a simple yet stunning dessert. Vineet Bhatia pairs his interesting Cardamom panna cotta with grilled peaches and rich white chocolate while panna cotta makes up part of Matthew Tomkinson's time consuming but spectacular Assiette of Apple dessert.